We are delighted to announce a sea kayaking optional add-on is now available on selected expeditions in the South Pacific, the Subantarctic Islands and the Russian Far East. Join experienced kayakers Judd Hill and Al Bakker as we launch our kayaks from theSpirit of Enderby which acts as a floating base camp for special excursions and shore landings. Judd has kayaked in many exotic locations including Fiji, Panama, Palawan, Antarctica, the Russian Arctic and the Russian Far East. Al has paddled whitewater and sea kayaks for 39 years in North America, the South Pacific, Japan, Antarctica, the High Arctic and all across Europe and has operated his own kayak tour company for more than two decades. Both guides are excited to offer a new perspective to your wilderness experience. Cruising in a small group of about 6 to 10 paddlers and led by Judd or Al, we will generally visit the same sites as the Zodiacs but be more independent and perhaps access areas not appropriate for Zodiacs. If the ship’s schedule allows, it may be possible to do an extended day trip, taking our lunch with us. The coastlines offer a wide array of habitats and sea kayaking opportunities, from sandy bays to rugged cliffs against a backdrop of extraordinary floral displays. They are also perfect sanctuaries for nesting seabirds, fish and marine mammals, so each day brings new challenges and fresh experiences to our small band of kayakers. 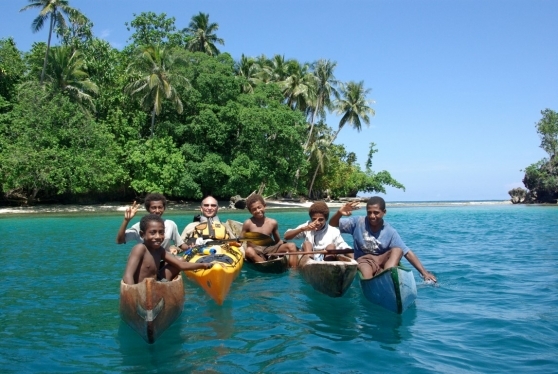 In the South Pacific, our kayaks are a source of fascination to the locals and a magnet for children who paddle their dug-out canoes out to join us and invite us back to their villages.